At its core, mindfulness refers to a felt sense of present-moment experience. This felt sense fundamentally differs from time caught in thought-driven judgements, interpretations, stories, fears, expectations, etc. These latter mental formations though “real” are far more than often not “true” and often serve to disconnect one from present-moment experience – the only experience within which true happiness and inner peace can ever be realized. Sustained or predominant conditions of disconnect cannot only lead to a persistent sense of life dissatisfaction, but may serve as a precursor to significant life difficulties including physical ailments, relationship problems, and substance abuse. In recent years, American culture has been so inundated with “mindfulness” concepts, strategies and services that its meaning has become diluted and almost synonymous with calm or relaxation. Through anxiety reduction is a common byproduct of “mindfulness,” it should be looked upon as just that – a byproduct – not a primary goal of mindfulness training. But the prescription for “the end of suffering” laid out by Buddha is more involved than just taking a deep breath. He laid out an eight-fold path that, through practice, can greatly facilitate one’s ability to remain connected to present-moment experience and optimize inner peace. Additionally, sustained connection to present-moment experience or we can say “life,” over time, instilling a heightened sense of connection to all of life, and all beings in ways that produce empathy and compassion. When one’s decisions and actions spring from this empathy and compassion, solutions are conceived and actions are taken that are truly in the best interest of all of life, not narrow self-interests that usually are unsustainable on either micro or macro levels. Thus “mindfulness” significantly transcends mere stress reduction. It holds the key to a world in which human beings act with a felt sense of connection to all of life. From this launching point comes the possibility of eradicating the most destructive problems facing individuals and society as a whole, while at the same time providing happiness and inner peace to individuals. This transformative potential is why mindfulness has begun to seep into our culture, and is what I strive to introduce and cultivate in the lives of all those with whom I work. Defensive and aggressive reactions to conflict most often arise because of an inability to be heard and understood. At the heart of most conflict lies some core issue that, if recognized, acknowledged, and explored, would provide the seed for peaceful, optimal resolution, truly in the best interests of the parties and more broad societal context in which they live. Often, the failure to identify and explore these core issues will keep the parties locked into a dualistic, adversarial posture that will serve to escalate the conflict. Whether a conflict involves one spouse not taking out the trash, a neighbor making too much noise, or a violent attack by a religious faction, one party to these activities feels on some level that they are not being heard – that core beliefs or concerns that they harbor are not being sufficiently acknowledged. Our predominant adversarial model of “justice” overwhelmingly operates in a way that allows no exploration of underlying precipitants of conflict. Attorneys are specifically trained to elicit “facts” from clients that they will then apply to the law in crafting a litigation strategy. Unfortunately, a client’s recitation of “facts” in reality often constitutes a “story,” and excludes subconscious motivations of one’s behavior. In order to begin exploring these less salient motivations of one’s behavior, an environment must be created that fosters an air of openness, respect, and trust so that individuals can become willing to explore and articulate underlying thoughts and emotions that may have led to, or exacerbated, the conflict. The structure of a courtroom, and the nature of civil procedure and rules of evidence, are antithetical to the creation of an open environment in which litigants might otherwise feel safe in exploring more sensitive thoughts and emotions. By contrast, among the benefits of mediation are ground rules specifically laid to establish an environment of respect. Sharply honed listening skills and ability to empathize will help an experienced mediator quickly begin to create an environment conducive to the exploration of more vulnerable thoughts and feelings of the parties. Not bound by rules of procedure and evidence, the parties can begin to articulate what is truly important to them. Often what comes to the surface are thoughts and feelings of which the parties themselves were consciously unaware. The seeds are then sewn for the crafting of a solution that can truly address the core needs of all involved. One might say that any solution falling short of this process is really no solution at all. To learn more about the benefits of holistic mediation, contact Holistic Lawyer and Mediator Michael Lubofsky at (415) 508-6263, or visit http://www.Holistic-Lawyer.com. Within a wide swath of civil litigation can be found a common denominator: The tendency of people in contemporary American society to sidestep responsibility for their own happiness and well-being, instead looking toward external factors to blame for undesirable outcomes or consequences. Almost by definition, our predominant adversarial model of civil litigation encourages, cultivates, and solidifies blame. For example, in filing an initial complaint to initiate a lawsuit, a plaintiff is basically required by procedural rules to allege facts that establish on their face what a defendant or defendants did wrong. The plaintiff is then required to set forth a request for relief stating how these alleged improper or wrongful acts caused harm or loss. Nowhere at this initial pleading stage would a plaintiff acknowledge any affirmative role that may have contributed to the harm of which he or she is complaining. It is only at a more advanced stage of pleading that an adverse party may file a “Request for Admissions,” which would prompt a party to acknowledge that his/her/its actions or inactions may have contributed to the problem at hand. So it often seems in a more broad societal context. We seem conditioned to focus on external factors to explain our problems (and much of our happiness). Many would maintain, however, that such thought-driven notions that attribute happiness or lack thereof to external factors are largely delusional. Such a misguided orientation may go far in explaining why litigation “victories” resulting from the adversarial process seldom produce an enduring sense that the conflict has been resolved in any sort of optimal fashion. In contrast, holistic law and mediation works to help dissolve defensiveness and entrenched conditioning to the point at which participants become better able to see through their misguided preconceptions. They are then better able to objectively assess their acts or omissions that may have contributed to the current conflict. At the same time, the cultivation of an empathic environment by the holistic lawyer or mediator facilitates this process as participants feel more understood and less judged for “mistakes” or “misunderstandings” that my have contributed to the conflict. To learn more about how holistic law and mediation can facilitate optimal, sustainable conflict resolution, contact Holistic Lawyer and Mediator Michael Lubofsky at (415) 508-6263, or visit http://www.Holistic-Lawyer.com. Through extensive mediation training and experience, a professional mediator becomes increasingly able to identify when a participant appears “locked into” a position, and then employ sensitive listening and empathic skills that may soon begin to loosen the grip of tightly-held, heavily egoic, positions. It is the dissolving of these firmly held positions that begins to shift a mediation focus from positions to interests. Freed from the grip of ego, one can begin to entertain an increasingly expansive notion of “interest” to transcend one’s “self interest” which may have predominated at the outset of the mediation. “Interest” can then begin to more fully encompass a spouse, a family, a community, or even all of life. In this way, mediation can serve a transformational function as a springboard for previously untapped solutions that transcend self-interest and serve to move the participants, as well as society at large, forward in more sustainable ways. To learn more about how mediation might work for you, contact Meditator and Holistic Lawyer Michael Lubofsky by calling (415) 508-6263, or by visiting http://www.mindfulaw.com. Where holistic law practice has at its core wisdom borne from a grounded sense of being, it is only within the mediation forum that individuals are afforded the freedom and flexibility to access this wisdom and have this wisdom guide participants toward optimal dispute resolution. In contrast, formal litigation imposes strict rules (e.g., rules of evidence) that ultimately ensure that disputes are settled based largely on objectively verifiable events. By definition, admissible evidence excludes intuitive knowledge and other phenomenon arguably behind the realm of human thought, including compassion and empathy, as salient factors to be considered by the parties when attempting to fashion a remedy to a dispute. From an evolutionary standpoint, it is understandable that interpersonal dispute resolution grew into a system that basically extracted emotion and unverifiable feelings from the equation. It is not difficult to imagine that in a lesser evolved form, such emotion and visceral sense was likely to lead to chaos and physical violence. It is also conceivable, however, that as a species we have evolved to a point at which we are beginning to recognize truth as lying beyond thought and objectively verifiable facts. Holistic law practice, by helping clients disidentify from learned conditioning and habitual reactions, can facilitate heightened access to this inner wisdom. A properly orchestrated mediation forum can ensure that the inner wisdom of all interested parties is elicited and properly considered in sculpting optimal dispute resolution. 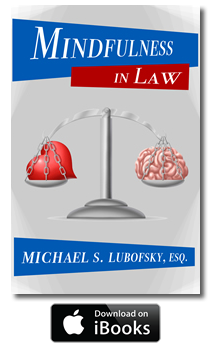 To learn more about holistic law practice and its applicability in the mediation context, contact Attorney Michael Lubofsky at (415) 508-6263 or visit http://www.mindfulaw.com.